Homepage. This page: Superminx Convertible seen at Goodwood. Hillman Books Whether for the Superminx Convertible as shown below, or any other type of Hillman, it is worth having a look on Amazon for books, DVDs, Videos etc. 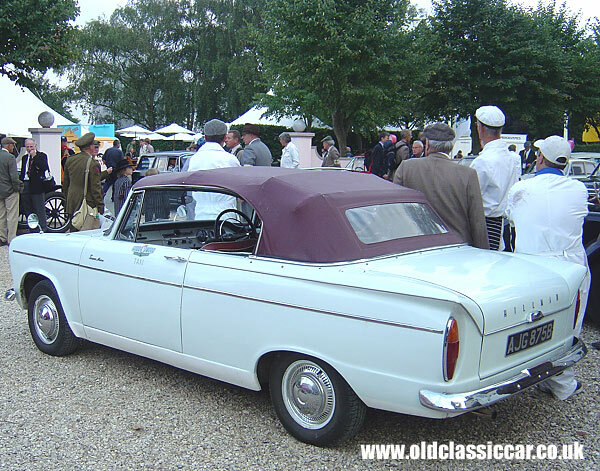 Have you seen today's eBay auction listings for the Hillman Superminx Convertible? Photograph of a classic Superminx Convertible at the Goodwood circuit. Lots of rare cars can be spotted around the Goodwood circuit. Here is a '64 Superminx convertible. If you can provide more info on Superminx Convertibles, or other Hillmans similar to this, please get in touch. In all there are 170 photographs featured from the 2006 revival, including competition cars, service vehicles, pushbikes, and a few interesting old motors owned by visitors to the race. To make things more manageable, they have been split into 2 sets (this Hillman is in set 2). To view the other photos in this set, visit the Goodwood Revival Part 2 page.